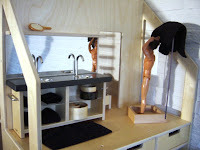 This massive modern dollhouse created by Liliane M.E.M Limpens has some nice playscale furniture. The house, which is roughly $2,000, comes with all of the furniture that a little home could need. I am impressed with the kitchen and bathroom pieces. The shower is easy to recreate with some craft items in 1:12 scale. I wrote Liliane--a very nice woman who surprised me by responding personally to my inquiry--to see if she would be producing a 1:12 version of this house. She said "no" because, in short, the market is better for larger scale dolls and the larger scale is better for mass gender appeal. I gently pleaded and tried to state a case for smaller mini modern collectors and design-savvy parents, but I'm sure she was just amused. 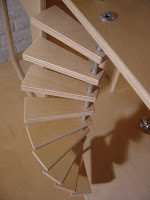 Oh well, the house and furniture are very cool, but not my preferred scale.